The Renaissance really gets going in the early years of the fifteenth century in Florence. In this period, which we call the Early Renaissance, Florence is not a city in the unified country of Italy, as it is now. 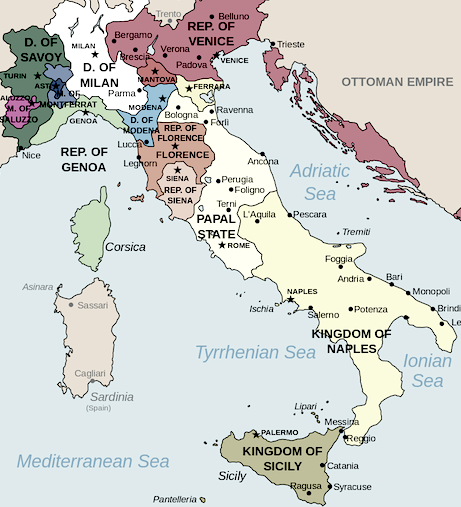 Instead, Italy was divided into many city-states (Florence, Milan, Venice etc. ), each with its own government (some were ruled by despots, and others were republics). We normally think of a Republic as a government where everyone votes for representatives who will represent their interests to the government (think of the United States pledge of allegiance: “and to the republic for which it stands…”). 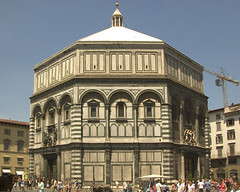 However, Florence was a Republic in the sense that there was a constitution which limited the power of the nobility (as well as laborers) and ensured that no one person or group could have complete political control (so it was far from our ideal of everyone voting, in fact a very small percentage of the population had the vote). Political power resided in the hands of middle-class merchants, a few wealthy families (such as the Medici, important art patrons who would later rule Florence) and the powerful guilds. Why did the Renaissance begin in Florence? There are several answers to that question: Extraordinary wealth accumulated in Florence during this period among a growing middle and upper class of merchants and bankers. With the accumulation of wealth often comes a desire to use it to enjoy the pleasures of life—and not an exclusive focus on the hereafter. 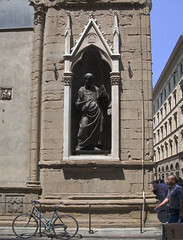 Florence saw itself as the ideal city state, a place where the freedom of the individual was guaranteed, and where many citizens had the right to participate in the government (this must have been very different than living in the Duchy of Milan, for example, which was ruled by a succession of Dukes with absolute power). In 1400 Florence was engaged in a struggle with the Duke of Milan. The Florentine people feared the loss of liberty and respect for individuals that was the pride of their Republic. Luckily for Florence, the Duke of Milan caught the plague and died in 1402. Then, between 1408 and 1414 Florence was threatened once again, this time by the King of Naples, who also died before he could successfully conquer Florence. And in 1423 the Florentine people prepared for war against the son of the Duke of Milan who had threatened them earlier. Again, luckily for Florence, the Duke was defeated in 1425. The Florentine citizens interpreted these military “victories” as signs of God’s favor and protection. They imagined themselves as the “New Rome” — in other words, as the heirs to the Ancient Roman Republic, prepared to sacrifice for the cause of freedom and liberty. The Florentine people were very proud of their form of government in the early fifteenth century. A republic is, after all, a place that respects the opinions of individuals, individualism was a critical part of the Humanism that thrived in Florence in the fifteenth century. Cite this page as: Dr. Steven Zucker and Dr. Beth Harris, "Florence in the Early Renaissance," in Smarthistory, August 9, 2015, accessed April 20, 2019, https://smarthistory.org/florence-in-the-early-renaissance/.